Beer itself is an ancient brew and dates back to the 5th millennium B.C. where its use is recorded at Mesopotamia and in Egypt. The earliest chemically confirmed barley beer to date was discovered at Godin Tepe in the central Zagros Mountains of Iran, where fragments of a jug, at least 5000 years old was found to coated with beerstone, a by-product of the brewing process. OUR FIRST BEER- MAN WHO MADE IT.PARRAMATTA RIVER BREWERY. The early hop-growing and brewing operations at Kissing Point, on the Parramatta River, is not the least interesting chapter of Australian history. Before entering into an account of what was accomplished by the man to whose enterprise and industry the early settlers, were indebted for their beer, I should Like to emphasise the fact that, at the time of which I write, it was considered among English-speaking people a fact beyond dispute 'that the daily consumption of a certain amount of fermented or spirituous liquor was indispensable to the preservation of health. That this was a complete delusion is apparent to modern enlightenment, but that such a belief existed among the early settlers must be borne in mind, or we shall hardly understand how it was that, almost concurrently with their efforts to procure food in the new land to which fate had brought them, they sought the means of manufacturing strong drink. Almost from the day the' colony began to make an advance in agriculture, must we date the 'commencement -of 'illicit distillation’. So strong was the desire among the' first settlers to enter into this business that many of them held their land grants only long enough to comply with the conditions necessary to give them, a possessory title, and then sold them, using the money thus obtained to procure the plant required for the illegal occupation they were bent on following. There was indeed such a demand for ardent spirits that illicit distillation was carried on wherever the necessary materials could be procured, and there is no doubt that in the vicinity of Kissing Point an enormous amount of spirit was illegally produced. It must be remembered that at this date ‘spirit’ was a very convenient 'article' for use in exchange or barter,' and there are instances of men selling land, which they had literally won from the wilderness by their own toil, for a few gallons of rum. The head of the Lane Cove River and some of the ravines in the Ryde district were no doubt, most convenient places for carrying on this unlawful but exceedingly lucrative industry. It is said that horehound beer, 0r what was called beer, was made in the early days from the honey of the small Australian bee, bittered with this herb but, later on, the authorities seem to have deemed it necessary to place all brewing and distilling operations under control. From Holts' Memoirs we learn that in 1802 he was arrested for distilling for his own use brandy from the cider peach, and though it is said that the Government were not altogether actuated by disinterested motives, he had to abandon the practice. The first man to enter upon the business of brewing in a legitimate and open manner, was James Squire, -one of the pioneer settlers, at Kissing Point, 'who was undoubtedly one of the -most remarkable 'en of the early days. He started as a settler at Kissing Point. On July 22, 1795 he received a grant of land there of 30 acres, and by industry and perseverance gradually acquired no less than 1500 acres, all in the vicinity of Kissing Point. It is difficult at this distance of time to discover exactly what use Mr. Squire made of his first grant of land, or at what date it entered his mind that it was possible to grow hops successfully in these latitudes, but there is no doubt that as early as 1795 he brewed his first beer, but the bitter constituent used in its manufacture1 was certainly not hops. My inquiries lead me to think that the first beer manufactured in New South Wales was bittered with horehound from the Government Stores, large quantities of this herb having been brought to the colony for medicinal purposes. It can hardly be contended that this first beer thus manufactured was of very high quality— in fact, on the authority of Boswick-we know that a tombstone was once to be seen at Parramatta which bore the suggestive inscription: ‘He who drinks Squire's beer lies here’! The early brew to which the author of that epitaph no doubt refers was soon improved upon. Mr. Squire soon had large fields of hops growing at Kissing Point, the fields extending back from the foreshores of the river- from a point a little to the eastward of the site of the present Ryde baths. The brewery was built on the high land immediately above the reef of rocks which runs out from Kissing Point, but it has long since disappeared, and where it once was there is now a cottage embowered among shrubs and flowers. The old brewery may still be traced, for underneath the cottage is the brewery cellar, hewn out of the solid rock. It may be asked where 'the water requisite for such an extensive business as that carried on by Mr. Squire came from. This it took me some little time to discover, but I at length satisfied myself, on the authority of Mr. Timothy Small, that the water used in brewing was obtained from very large and deep wells cut out of the solid rock, which can still be seen. It must not be thought that Mr. Squire was allowed an altogether free hand in his brewing business; Government stepped in and limited his output to a certain quantity per week, the object probably being to prevent undue competition with the liquor trade carried on by the officers under the Government of the day. It was not till later that the restriction was removed, and Mr. Squire then carried on an extensive business, as he had practically a monopoly of the brewing industry. Mr. Squire died in 1822, and his business was carried on by his eldest son until 1827, when he, too, died, and the brewery finally dosed. Mr. Squire was buried in the old Devonshire street cemetery, and when this area was required for railway purposes his 'remains were removed to the La Perouse cemetery. So carefully was this done, that I was able with very little difficulty to discover the tombstone which- marks his final resting-place, and which is inscribed: — In Sacred Respect to the Remains of Mr. James 'Squire, Who 'departed 'this life May 16th, 1822,' Aged 67 years. J. Squire, son of the above, Died 12th March, 1826.Aged 28 years. OUR FIRST BEER. (1914, July 15). The Bathurst Times (NSW : 1909 - 1925), p. 4. Retrieved from http://nla.gov.au/nla.news-article111505016 In Text ILlustration: The farm and brewery of James Squire at Kissing Point about 1820. The hop fields are at the left of the buildings. The artist was Joseph Lycett, who was transported to Australia for forgery. After his return to England in 1822 he published his landscapes of Australia, a series of lithographs and copper-plates. Creator Lycett, Joseph, ca. 1775-1828. Title Kissing Point, New South Wales, the property of the late Mr James Squires [picture] / J. Lycett delt. et execute. Date London (73 St. Paul's Church Yard) : Published by J. Souter, 1825. Nla.pic-an7690866-v.jpg ‎courtesy National Library of Australia. HISTORY OF PARRAMATTA,& DISTRICT. WRITTEN FOR ' THE ARGUS ' BY H. W. H. HUNTINGTON. No. XVII. First Brewery on the River. GOVERNMENT HOUSE, SYDNEY, Saturday, 21st July, 1810.
shall hereafter be detected in retailing Beer, Ale, or Porter, without a regular Licence may depend on being prosecuted with the utmost Rigour of the Law. The Names of those Person who have received Beer Licences at Sydney, are now Published for the Information of all concerned. Thomas Boulton, Church Row, Rocks. Elisabeth Mack, Back of the Hospital. Catherine Johnston, Bell's Row, Rocks. Jame Vandercom, Windmill Row, Rocks. George Phillips, Church Row, Rocks. William Hall, Serjeant Major's Row. James Bull, Back Row West. John Colles, Back Row East. James Grady, Church Row, Rocks. Wm. Davis, near the Market Place. Jane Muckle, Back Row East. Edward Robinson, near the Burial-ground. Thomas Barnett, Back Row East. James Wild, Back Row East. (signed) ELLIS BENT, Judge Advocate. In Text image: Major-General Lachlan Macquarie CB; Illustration from Volume I of "The Picturesque Atlas of Australasia" by Andrew Garran, 1888. "The earliest encounters between the English colonists and the Wallumedegal took place on the Parramatta River at The Flats, the low-lying mangrove swamps between the present Homebush Bay and Meadowbank. This area was first settled in January 1792 by former marines who were granted land at the Field of Mars (later Kissing Point and Ryde). Two Aboriginal men are seen (at left) on the wharf of James Squire's brewery at Kissing Point. Bennelong spent the last years of his life in Squire's orchard at Ryde and was buried there in 1813 when he died after a long illness." - Eora exhibition caption, 2006. 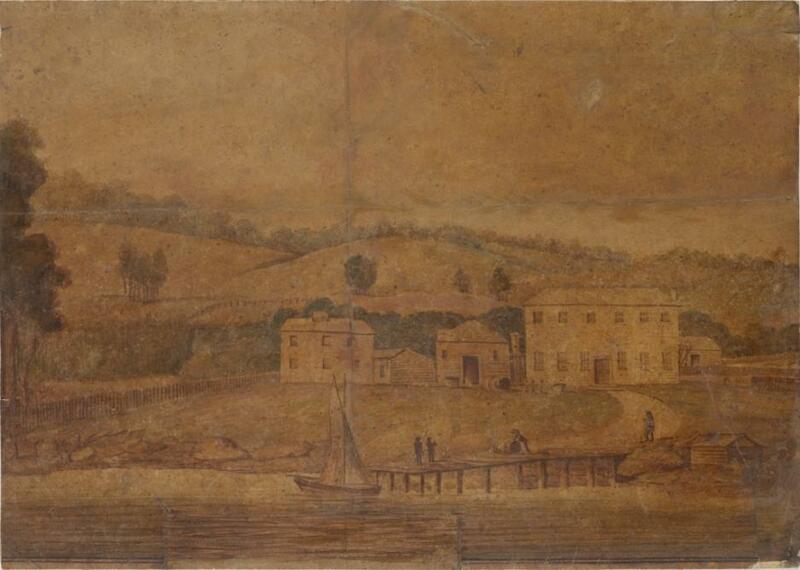 Squire's Brewery, Kissing Point / watercolour by unknown artist. Image a928850 V1A / Ryde / 5, courtesy State Library of NSW. When Australians were fast going to the dogs 150 years ago, Governor Philip Gidley King, in one of the notable paradoxes of Australian history, tried to save them with beer. "The greatest blessing that can be bestowed on a colony," Governor King wrote when reporting the opening of the first public brewery in Parramatta on September 15, 1804. Governor King spoke with fervour and relief because he hoped beer would "greatly, if not entirely, do away with the inclination for spirits," which was keeping "the greater part of the inhabitants in a state of beggary." He had conceived his plan of Salvation in 1801. But he had to wait impatiently for three years for a brewing plant to come from England for the brewery at Parramatta. "The prices put on the beer, "place it within every person's reach," he said. They certainly did-at 1/ a gallon in the buyer's own cask at the brew house, payable in wheat, barley, hops, casks, or iron hoops. THE Governor fixed the price at taverns at 3d a pint, and 'allotted a quota of five gallons a week for military and civil officers, three gallons for superintendents and sergeants, and whatever was left for settlers. His order announcing the beginning of brewing promised a free distribution when supply exceeded demand. make beer bitter. Governor King reported hopefully that Rushton knew roots and leaves, which were substitutes for hops. GOVERNOR KING'S reform was strenuously opposed. The military garrison, the New South Wales Corps, held a monopoly of the sale of spirits from 1793 until the British Government disbanded it in 1810 after it had insulted King and in 1808 deposed Governor Bligh (of the Mutiny of the Bounty). Governor King prohibited imports of spirits. But American Vessels, loaded with spirits, kept turning up in Sydney Cove with what he called "the old excuse of receiving repairs, water, etc." He once sent away a ship with15,000 gallons of spirits. "The use of illicit stills," he said, "was much facilitated by the number of Irish we have...The orders to prevent that practice have, in a great measure, been ineffectual, although several stills have lately been seized and the workers sent to other settlements. "Yet, if report is true, there are many others at work, and so concealed that detection by the police is altogether impracticable." BEER did not end Governor King's troubles; it increased them. Sadly, he reported: "Being anxious to turn the Public Brewery to as good an account as possible in preventing thirst for spirits, which is so prevalent, I found after a year's experience that the Government was at a great loss and expense in carrying on that object." So private enterprise took over the £ 2,500 plant. Brewer Rushton agreed to brew strong beer at 1/ a gallon and table beer at 6d a gallon, and pay a rental of200 gallons of beer a month for the convicts. As if to mock the efforts of future liquor reformers, Brewer Rushton had to undertake "not to dispose of the beer to individuals for the purpose of monopolizing its sale by retail, but to make its distribution as general as possible." Rushton did not renew his lease. Some historians think that the racketeers in spirits may have made the brewing business hazardous for him. But the Governor's "greatest blessing" did not languish as other brewers leased the Government brewery. James Squire, a home brewer at Kissing Point,' Ryde, since1 795, also was serving the public. KISSING POINT was a favourite picnic spot, and, no doubt, Squire's brew was an attraction. Accounts associating the naming of the point with three of the early governors discreetly mention only its inviting, grassy bank as the reason for vice regal patronage. These accounts say that, "while Governor Paterson was having a nap after lunch, a lady won a pair of gloves in the time honoured way"; .and, next, that "Governor Hunter indulged himself in the heroic and delightful task bf setting the ladies ashore, and the first to set foot on dry ground rewarded him with a kiss." An auctioneer's advertisement in 1854 gave a livelier version: "Kissing Point? Who knows the derivation? Not even Dr. Wooley, of the University of Sydney. "A lady (unmentionable) then said: 'Governor Macquarie, the place I am now standing on I shall name, with your permission, Kissing Point.' "
"Ye Who Wish to Lie Here, Drink Squire's Beer." "He was the Whitbread of New South Wales," another account said, likening him to an English politician, a London brewer's son, who sponsored a Poor Law Bill. "His beverage has a general good name throughout the Colony, and he himself is universally respected, especially as the friend and protector of the lower classes of settlers." In Text: [Philip Gidley and Anna Josepha King, and their children Elizabeth, Anna Maria and Phillip Parker] / watercolour portrait by Robert Dighton, date of work: 1799. Image No: ML 1244, courtesy State Library of NSW. From left to right: Anna Josepha, Elizabeth, Anna Maria, Phillip Parker and Philip Gidley King. Both Anna Maria and Phillip Parker King were born on Norfolk Island, Phillip in 1791 and Anna Maria in 1793. Robert Dighton painted this portrait of the King family in England in the year Philip, his wife Anna Josepha and their youngest child Elizabeth left for NSW, where King had been appointed Governor. The Kings did not see Anna Maria or Phillip Parker again, until 1807 when they returned to England from the colony. 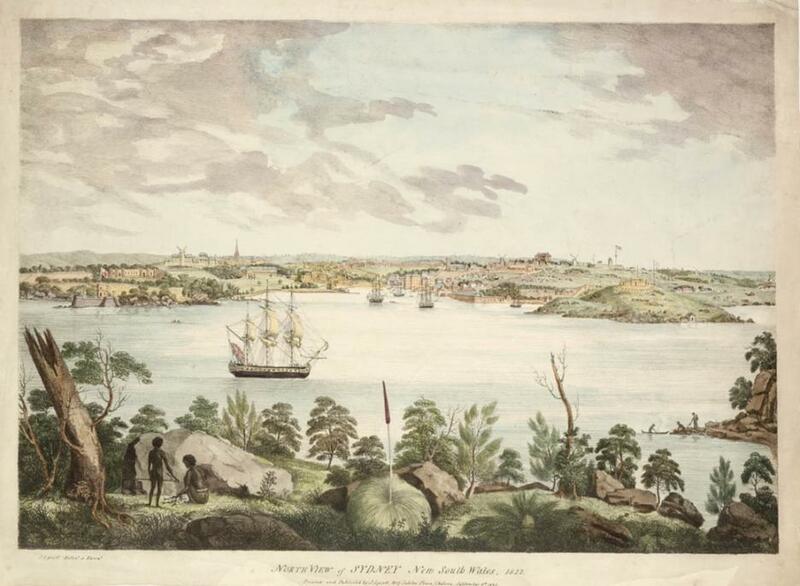 North View of Sydney New South Wales, 1822 / J. Lycett; Creator: Lycett, Joseph, ca. 1775-1828, Call Number: DG V1 / 11, Digital Order No. a128797 Courtesy State Library of NSW. Beer In Sydney Threads collected by A J Guesdon, 2013.